Billingshurst unveiled their new pitch perimeter fencing, spectator fencing and security gates last Wednesday evening in a prestigious friendly with Brighton & Hove Albion’s under-18s. These new additions to the facilities at Jubilee Fields are thanks to a grant from the Premier League through the Football Stadia Improvement Fund – the largest funders of non-league football in the country. While the football on the evening didn’t go ‘Hurst’s way, suffering a 12-0 defeat to the Premier League club’s youngsters, that didn’t dampen the club’s spirits. 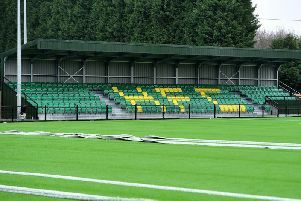 Chairman Kevin Tilley said: “We are delighted to be able to complete our ground improvement project, and we are extremely grateful to the Football Stadia Improvement Fund and the Premier League as without their support we would not have been able to complete the project. “We were very pleased to welcome Brighton under-18s to Jubilee Fields to formally open the new facilities and are grateful to Brighton and Hove Albion to support us in this way. The project was made possible thanks to a £17,931 grant from the Premier League, through FSIF, the sister organisation of the Football Foundation. Billingshurst was established in 1891 and currently operates three senior sides and a thriving junior section, with teams running from under-eights through to under-16s. In 2016, the club were awarded a £70,723 grant from the FSIF to install a new 100-seater stand, hardstanding and floodlights at Jubilee Fields.